Husband saw the pink school house as soon as we turned from Hwy. 64 to Hwy. 285 outside of Taos, N.M. Perhaps the giveaway was a big mural painted on the building that said, “The Pink School House.” It looked photo worthy, the gate was open and there wasn’t a “no trespassing” sign, so we drove in. We took a few pictures, and then I noticed them – an Igloo cooler, a grill, a hot tub. Holy bats. This was someone’s house! And there we were, snapping away in the front yard. We quickly packed up and sped out. Thankfully the owners weren’t home! 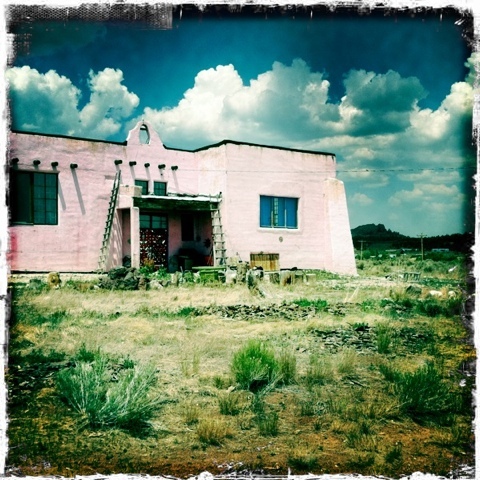 This entry was posted in Photography and tagged New Mexico, pueblo, school house. Bookmark the permalink.